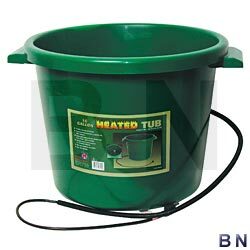 Provide fresh water to your livestock in the winter using the Farm Innovators Heated Stock Bucket. This 16 gallon bucket is the perfect size for watering horses, cows, or a flock of sheep. Hidden beneath the bucket, a thermostatically controlled heating element goes unnoticed and undisturbed by the animals. The element activates as the temperature drops below freezing and automatically turns off when the temperature approaches 40° Fahrenheit. The plastic body adds durability, and the two large handles make moving the unit simple. Use this Heated Stock Bucket to provide your livestock with fresh water all winter long. One year guarantee.